Honor Club has a history of close connections with the 4-H Camps in North Carolina, and has been involved with many different service projects to help keep up the camping centers and provide valuable camp opportunities for youth across the state. 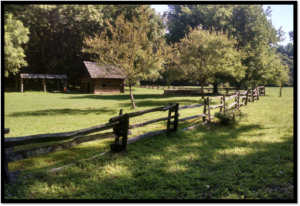 This page will stay updated with current involvement opportunities at Betsy-Jeff Penn, Millstone 4-H Camp, and the Eastern 4-H Center, so be sure to check often for updates! 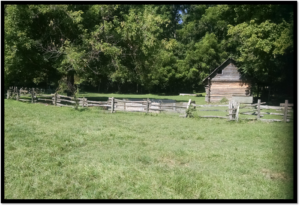 Betsy-Jeff Penn 4-H Educational Center is currently working on replacing the fencing around the historic Pioneer site and are looking for service-minded 4-H volunteers to assist in removing the current fence on Saturday, October 6th. This will be an all-day project that takes place at Betsy-Jeff Penn, located at 804 Cedar Lane, Reidsville, NC 27320. 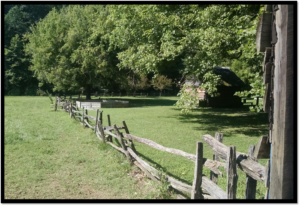 The project involves removing the old 280-ft long split-rail fence and replacing it with rough-cut treated boards that will last longer. The project will be split up over several days in the fall, and Honor Club members are needed to make the project happen! Cabins will be available on Saturday evening for those helping with the project who need overnight lodging. For more information, contact Jeff Johnson at jljohnso@ncsu.edu. The new fence will look like the photo below. We hope you’ll come out to be a part of this service project! 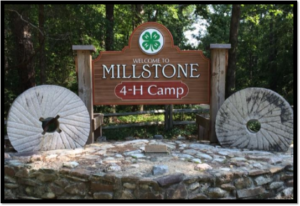 You’re invited to join North Carolina 4-H at Millstone 4-H Camp for a night of fun, food, and bluegrass at the second Pickin’ in the Pines Bluegrass and BBQ Benefit Concert in the beautiful Ellerbe, North Carolina! Featuring world-class bluegrass acts Flatt Lonesome, Long Gone Bluegrass, and Lauren & Lane, this adult-only event provides scholarships for North Carolina youth to attend summer camp at Millstone. 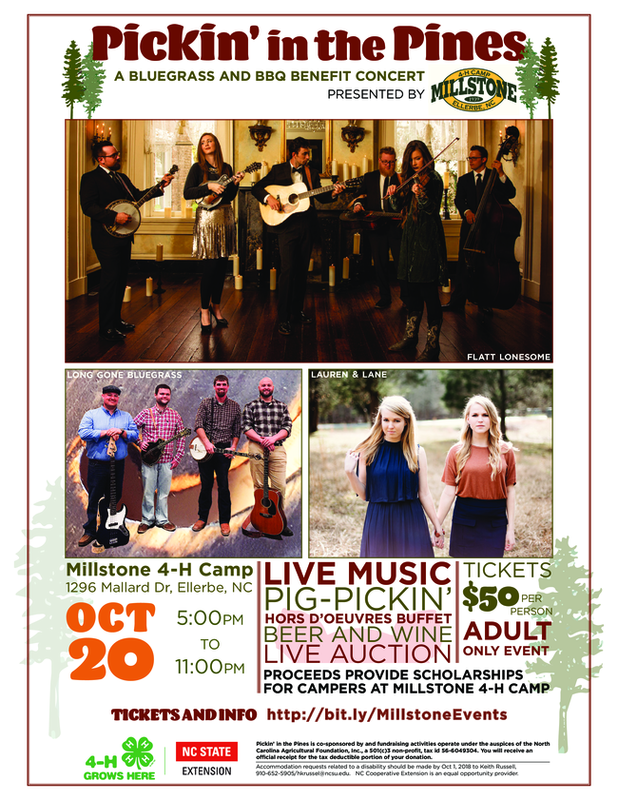 Bring your camp chairs and a love of bluegrass for an evening of LIVE music, pig pickin’, hors d’oeuvres, and a live auction! Last year’s inaugural event raised enough funding to provide scholarships for 28 youth from across the state of North Carolina to attend 4-H camp in 2018. There are few tools as powerful as the camp experience to positively change the lives of young people. Support the youth of North Carolina and attend Pickin’ in the Pines 2018! Tickets and information are available at http://bit.ly/MillstoneEvents. For up-to-date information, you can also follow this event on Facebook. Beer and wine are included in the ticket price. This is an adult-only event. Rental cabins are available for overnight accommodations at $150 per night. Each cabin is equipped with air conditioning, heat, bathrooms, and showers and can sleep up to 11 people. To reserve a cabin, call (910) 652-5905 or e-mail Erehn Frye at enmoss2@ncsu.edu. Accommodation requests related to a disability should be made by October 1, 2018 to Keith Russell at (910) 652-5905. For a full band schedule, frequently-asked questions, and to purchase tickets, visit http://bit.ly/MillstoneEvents. Become a 2018 Pickin’ in the Pines Sponsor! To make this event a success for the youth of North Carolina, we need support from you! Youth from sixteen counties were able to attend camp at Millstone in 2018 because of sponsor support. If you are unable to make the event, consider becoming a sponsor for as little as $100. For more information, visit http://bit.ly/MillstoneEvents.